The purpose of our three-month long trip to Asia was to train in Cambodia and volunteer teach in Thailand, but we thought it was necessary to end with a week-long detour into China since we were in the right hemisphere and everything. (You can read a little about this Chinese detour here and here.) 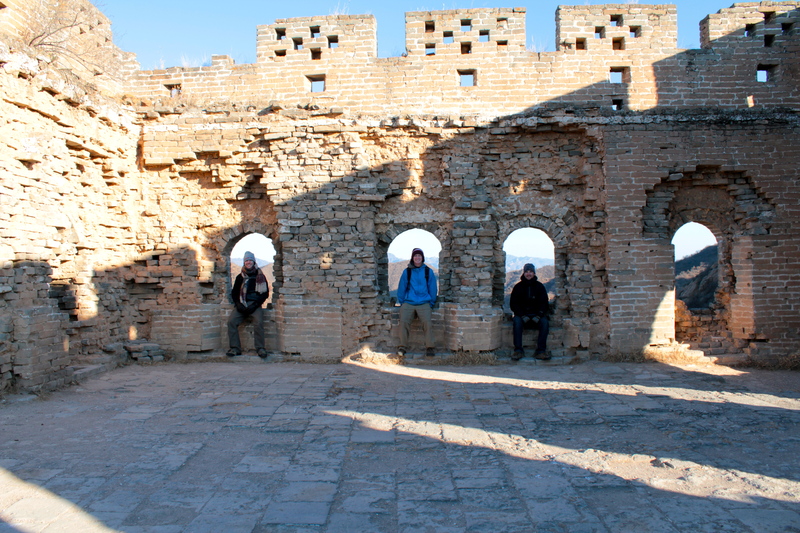 We enjoyed every stop we made, but we had one major goal in mind: To visit the famed Great Wall of China. I’m happy to say that on our very last day in Asia, we finally made it. 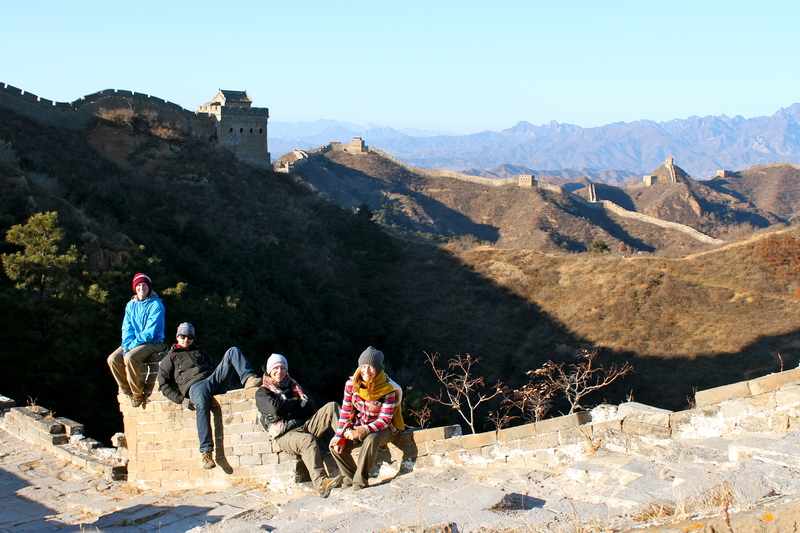 Furthermore, we accomplished the impossible: We actually had the Great Wall to ourselves for most of the morning. In China, a land of 1.35 billion people and countless tourists, it can be difficult to find personal space. And this is the Great Wall. Surely, even in December, we would be admiring it with fellow crowds of tourists. 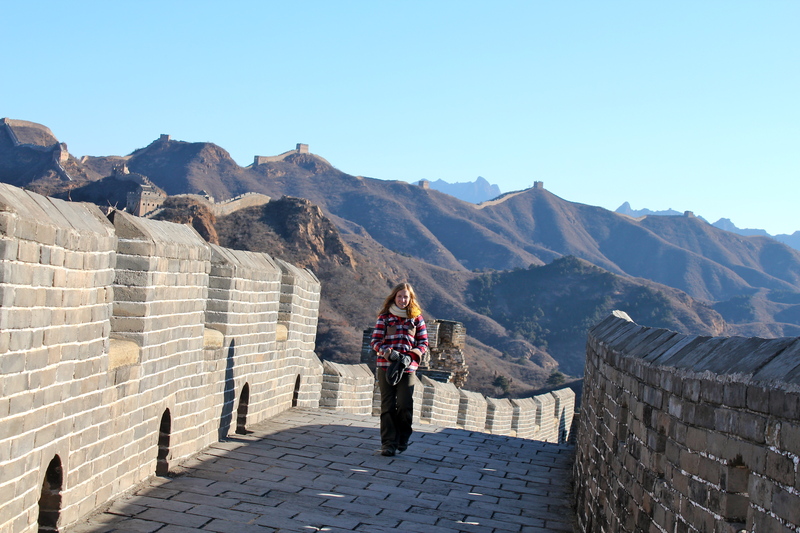 But I am not kidding when I say that the one and only time I enjoyed complete solitude in my almost three months in Asia was on the Great Wall of China, which, depending on the source, is visited by four to ten million tourists a year. Amazing! First, it was not peak travel season in China. When we went, it was between Chinese holidays. Near the Chinese New Year holiday in January, more people start traveling again, but we were there weeks before the Chinese New Year, and also, the schools were busy wrapping up their semesters. Second, we were helped out greatly by the friendly manager at our guesthouse in Beijing. 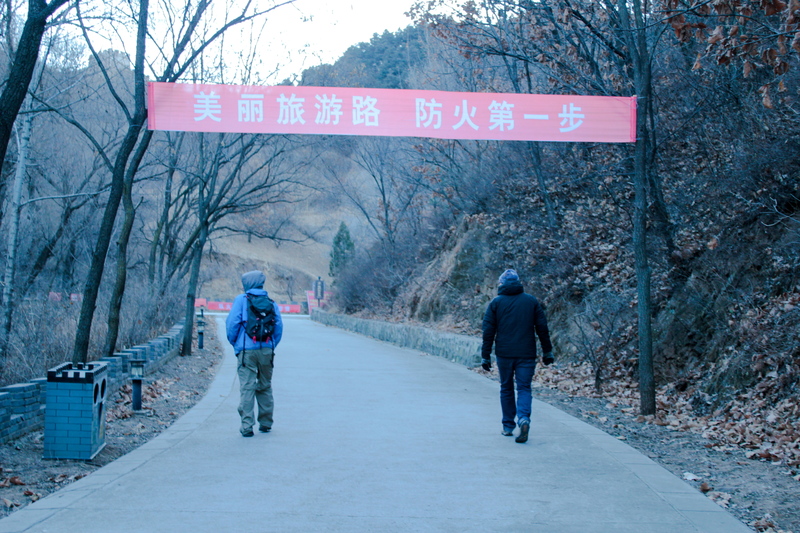 He had recommended going to the Jinshanling section, which is a bit farther away than the more popular sections of the Great Wall near Beijing. We took his advice, and I’m glad we did. He also helped by lining up a private car to drive us there. As we had flights to catch in the afternoon, we decided to leave at 5:30 a.m. and were there before 8:30. I’m not even sure if it was open yet, actually. I think they just let us in anyway. Third, it was absolutely freezing. Granted, I had just left Thailand where I’d been sweating in the heat and humidity for months, and I had turned into a bit of a cold weather weeny. But even hardened, wizened agriculture men Adam and Danny, who had recently left the North Dakota winter, claimed it was cold. And they were well prepared! Tommy and I, on the other hand, were trying to make do with any clothing we had from our Thailand backpacks that could count as slightly warm, as well as scarves, hats, a fleece-lined flannel, and other outerwear hastily purchased on the China streets. Tommy was forced to wear socks under hiking sandals. 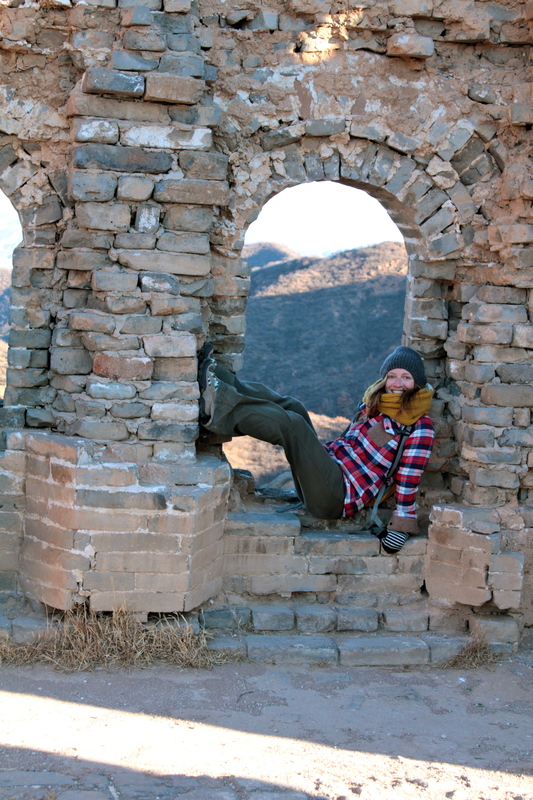 Yes, it was cold, my friends; but apparently North Dakotans are among the few crazy enough to go romp around on the Great Wall when the temperature is 10 degrees Fahrenheit and there is a biting wind blowing across the rugged Yanshan mountains. It was probably good for me, anyway. I needed a taste of winter so I would be prepared to go back home. 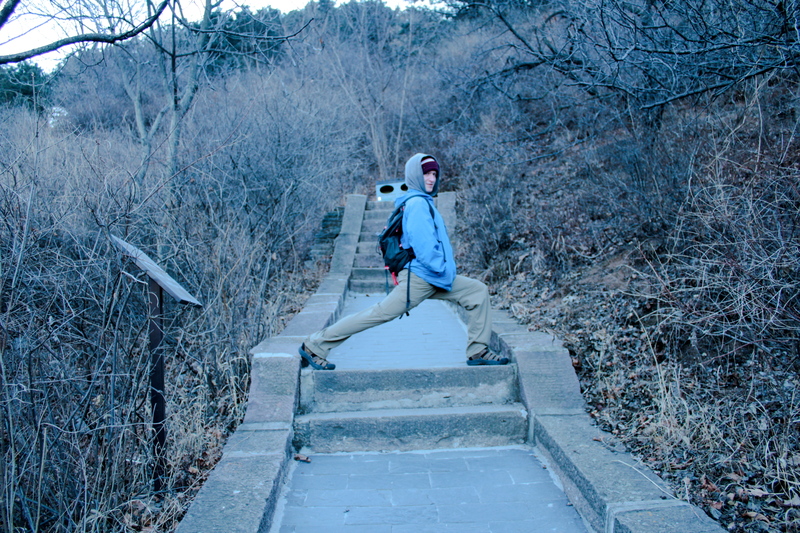 Standing on the Great Wall for the first time was breathtaking. (Perhaps I’m remembering the icy wind that hit me in the face and literally took my breath away.) But in seriousness, in that moment it was worth every minute spent applying for visas and every penny spent getting there. 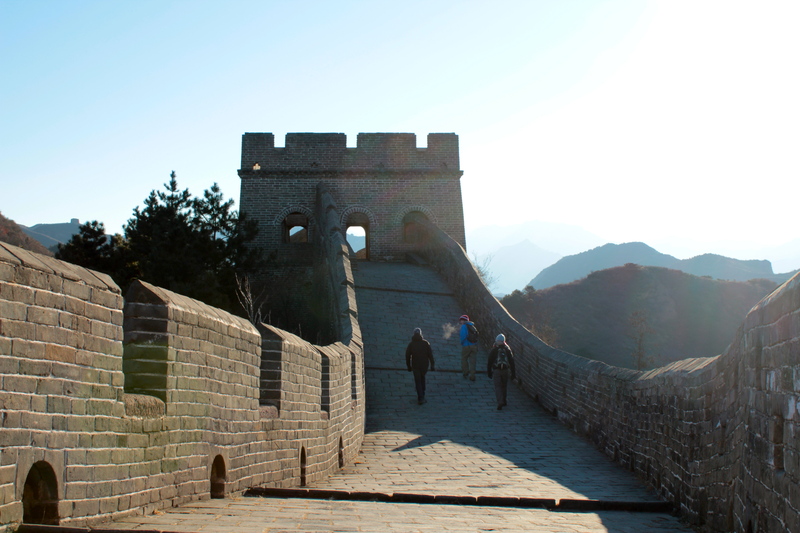 At the Jinshanling section, the Great Wall stretches over ridges and mountain peaks as far as the eye can see in either direction. And once we were up in the sunlight hiking around, even the cold wasn’t so bad. We were like a group of kids on a really impressive playground. 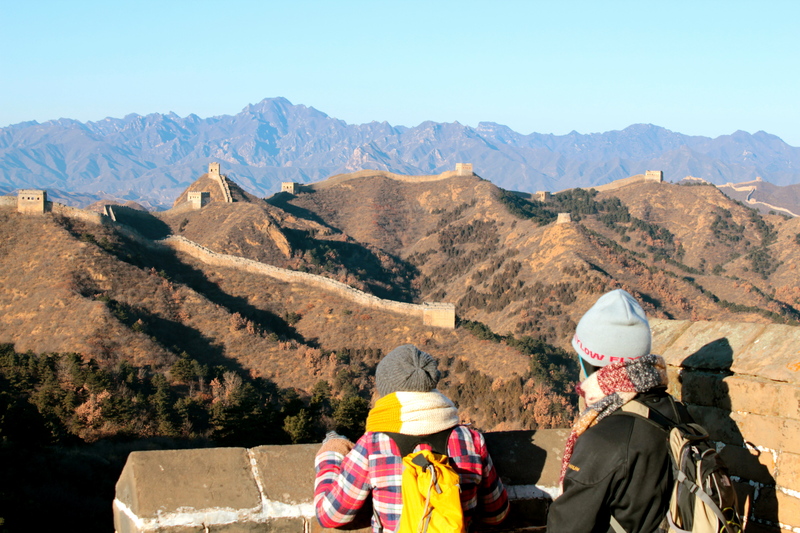 The first humans we spotted in the late morning were two Chinese merchants, a chatty, smiley wife and silent, serious husband, who haul their coolers and water jugs to the top of the Great Wall every day to sell drinks to thirsty tourists. These two are tough, I tell you. The cold barely phased them. 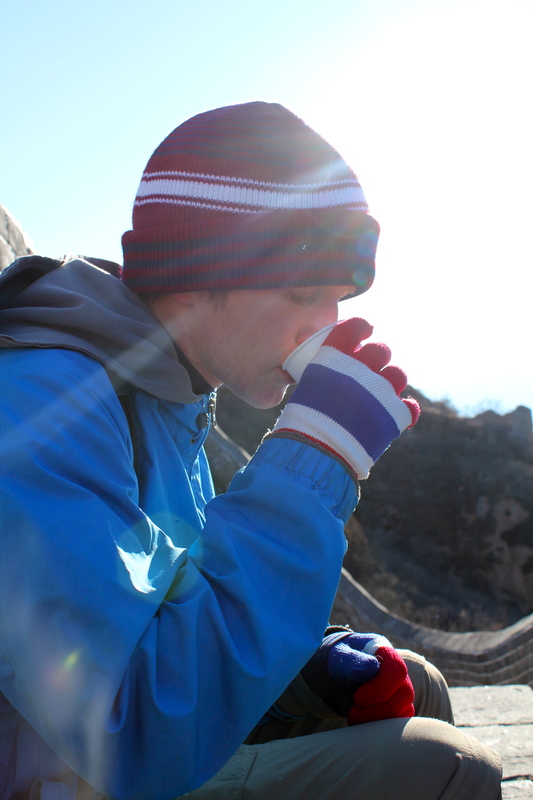 Partly in admiration and partly in desperation, we purchased cold beers and hot black tea with the last of our RMB – it seemed fitting to spend it there, despite the steep prices – and sipped it on the Great Wall while the wife cheerfully learned how to use my camera, laughed at our pronunciation of “thank you” in Mandarin, and taught us a couple of new words. We did eventually run into a smattering of tourists straggling onto the Wall, who looked equally as cold as we did, but we were on our way out by then. We had flights to catch and real lives to get back to and these kinds of moments can only continue in one’s memory, anyway. It was a bittersweet feeling, stopping on those ancient stones and gazing over the mountains, knowing I wouldn’t be back to this part of the world for a while. Mostly, it was just bitter because of that bitter cold I mentioned. Because as far as memories go, this one’s pretty sweet.